Ballandean Estate’s is launching its twelfth Strange Bird™ this Australia Day, the much-anticipated Malvasia (mal-VAH-zia). Originating in Croatia, and widely grown throughout northern Italy, this variety is a truly rare alternative wine, with less than 200 Australian estate-grown cases produced for the 2018 vintage. Demand will outstrip supply quickly at Ballandean Estate, as just 90 cases of Malvasia were produced for the 2018 vintage. Queensland’s 27th Strange Bird™ Malvasia will be available for tasting and sale at the cellar door on Australia Day 2019, and for sale online. We had a block of chardonnay vines that we were looking to rejuvenate. Dad (Ballandean Estate owner Angelo Puglisi) is always keen to experiment with Italian varieties. His interest in Italian varieties is not just about the increased diversity of smells and flavours, but most importantly about structure: and, specifically, acid. Grapes grown for natural acid balance deliver a fresh expression of our granitic terroir, and require minimal intervention in the hands of the winemaker. We often visit the north of Italy, Veneto and Venice where Mum’s (Mary Puglisi’s) family comes from. Soave is one of our most quaffed holiday wines — and Malvasia is blended with so many of the crisp dry Italian whites we love. After the runaway success of our Strange Bird™ Fiano, when we discovered Malvasia was an early ripening, late flowering aromatic — we were inspired. In 2015, Angelo Puglisi planted one acre of Malvasia on the Ballandean Estate vineyard. 2017’s vintage yielded just 20 litres, an experimental batch. 2018’s vintage was picked in March after an optimal growing season. The fruit for 2019’s vintage is looking magnificent, with big, loose bunches of fruit on the vines. Berries medium to large, yellowish with thick skin, juicy flesh and stone fruit characteristics. Set to thrive on the Granite Belt, Malvasia has a good tolerance of cold winters, early frosts and windy sites. 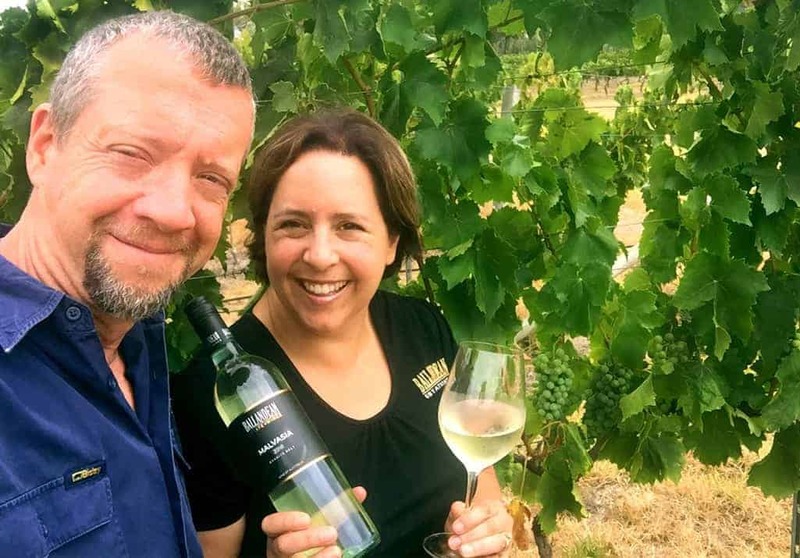 Ballandean Estate winemaker Dylan Rhymer has applied a unique approach to this great Italian white. I wanted to distinguish this wine with a completely different flavour profile to our Fiano. The wine has spent just three months in oak barrels, as opposed to 12-14 months for traditionally oaked white such as chardonnay. This has completely changed its structure and aromatics, lifted the nose and intensified its mouth feel, without bringing oak onto the palate. The process delivered a crisp, dry, fruity, perfumed wine, a great match with lighter summer foods or creamy brie,” said Rhymer. The Italian varietal Malvasia from Northern Italy produced by Ballandean Estate is a delicious crisp Italian-style dry white wine, and textured, set to match the success of the critically-acclaimed Fiano, a fuller wine from the warmer Campania area. … wicked! Spicy, refreshing and zesty with fresh tangerine, nectarine and peach notes, finished with a light honeyed tang with loads of sizzle and tension!